I have a .csv document that I need to make some transformations to before upserting into Salesforce. 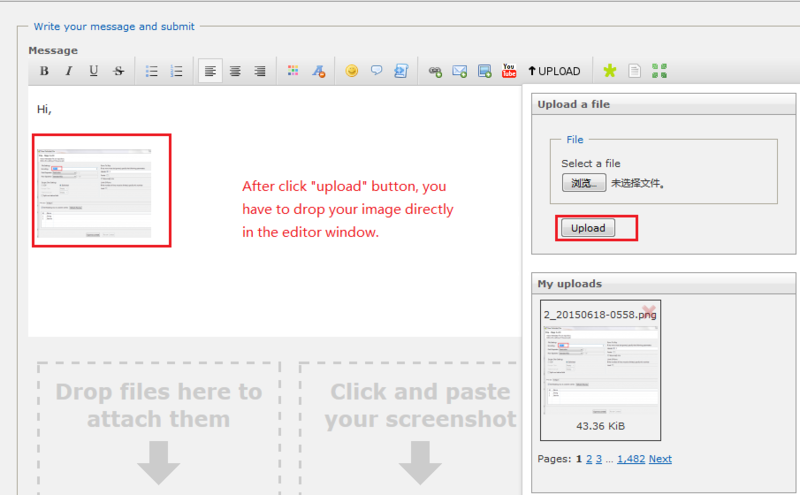 Here is how the document appears as is. The first row of the document represents Skill Names (MECH TECH (TM2500), MECH TA LM 2500, etc…). The third row represents Skill Categories (TM, MECH TA). 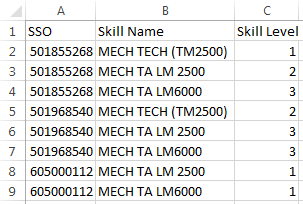 MECH TA applies to both skills MECH TA LM 2500 and MECH TA LM6000 even though it is not filled in. The SSO represents a unique ID for the People under Rep Name. I would like to use Talend to perform a transformation to generate two different sets of data. I am able to use the tSplitRow component to separate out the Skill Names, but cannot figure out how to do the rest of the transformation. Can anyone help solve this problem using Talend? We cannot see the image you provided. Could you please upload your screenshots into forum? Elaborating your case with an example with input and expected output values will be preferred. Can you see the images now? I uploaded them and dragged into the post. We have seen your screenshots. Thanks for posting them again. We are working on your use case then come back to you as soon as we can.